Whatever the colour scheme, there’s no escaping that Burton’s twisted version of Wonderland is way too scary for fragile little minds while Disney’s kid-friendly animated version remains too saccharine for most adults. 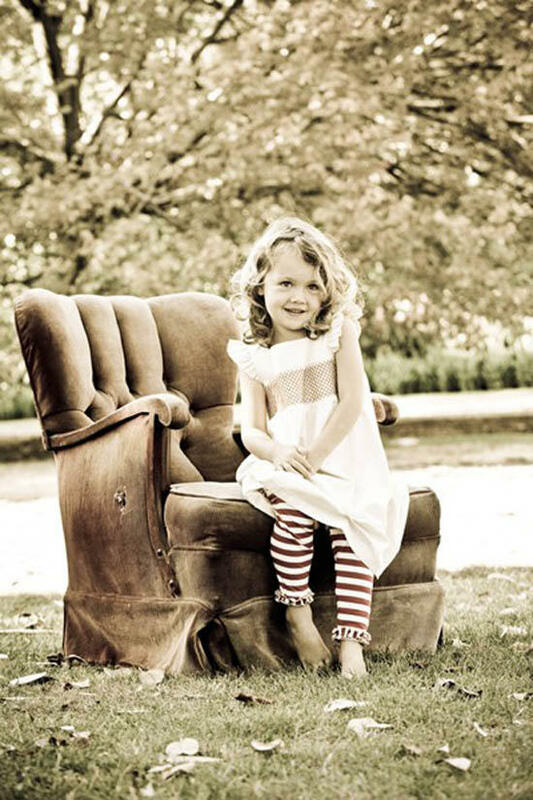 So Babyology has compiled a failsafe and supremely stylish guide to all things Alice that lets big people share the wonder with the little ones in their lives without sending either running for cover. It starts with the hair. Alice, of course, wore a neat little headband to keep her locks in check while chasing white rabbits down rabbit holes and all that. Ergo the Alice band. 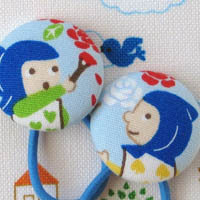 How much groovier would she have looked in these retro hair ties from Little Choopie (above top left). 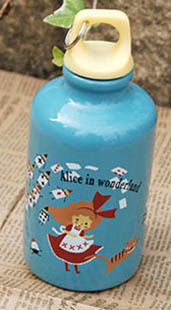 Alice and her not-quite-white rabbit come in a special tin for $8.25 plus post at Design Child. 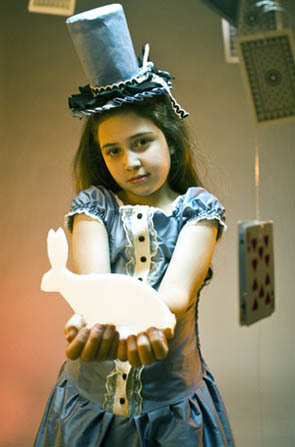 Or head to Etsy for more Wonderland-worthy head gear. We love these black and white ponytail ties (above left) – with just a teeny-tiny hint of bling – for US$4 from seller CuckooBoo, who also has a cutesier set of four featuring Alice, the Mad Hatter, Cheshire Cat and White Rabbit for US$8. 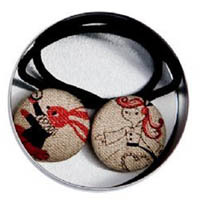 There’s also a rather fabulous twin set of hair ties featuring the Deck of Card gardeners (top right) over at Once Upon a Button for US$4. Alice makes a great decorative theme for the nursery and these delightfully creative vintage-style Wonderland prints, pictured above, from Melbourne-based paper artist and mum-of-three Angeline O’Day are the perfect starting point. 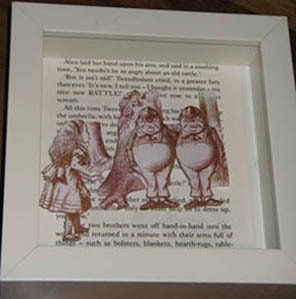 Each hand-cut and hand-framed print depicts one of ten scenes from the original Lewis Carrol tale, with the image hovering cleverly over a matching chapter extract from the book. Visit Almond Tree Frames to order for $45 per print. 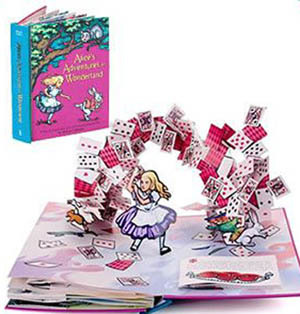 We’ve shown you some lovely Alice in Wonderland storybooks before but nothing beats the brilliance of this pop-up edition from Robert Sabuda. 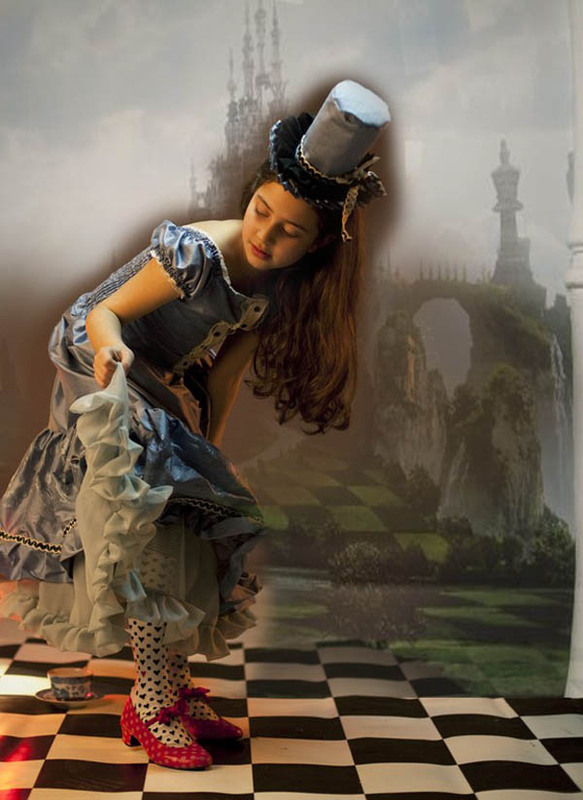 Quite possibly the world’s best paper engineer, his version of Alice’s Adventures in Wonderland is nothing short of spectacular, with twenty-four fabulous and impossibly intricate pop-up scenes to entrance your child. It’s $39.95 plus delivery from Dymocks. Of course, Alice isn’t Alice without her trademark blue-and-white pinafore. Here’s some Alice-esque frocks we like even more, starting with a pretty sky blue and white floral number (above left) with vintage pearl buttons from Bonny Blue Arts (US$75) at Etsy. Stunning. Ditto for the spectacular silk and organza pettiskirt-style dress (above right) from Etsy seller Flowersnbutterflies (US$285). The dress, all sumptuous silk shirring with adorable capped sleeves and trimmed with buttons, frills and bows, was designed with Tim Burton’s Alice in mind. The matching dupioni silk hat is US$46. 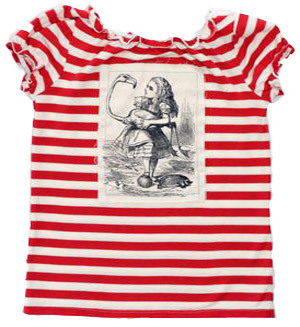 And don’t forget the sweet-as-pie Wonderland dress from Mahar Drygoods that we revealed to you last year. For something closer to home, there’s Heavenly Creatures’ divine Alice-inspired collection. 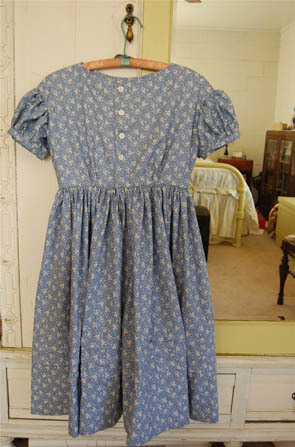 The lovely Alice Smock Dress (this one’s already hanging in my own daughter’s wardrobe!) 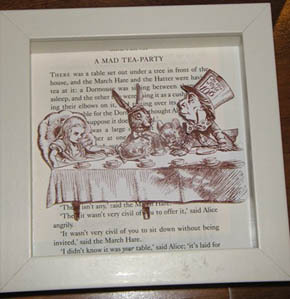 is perfect for a tea party, with or without the Mad Hatter in tow. 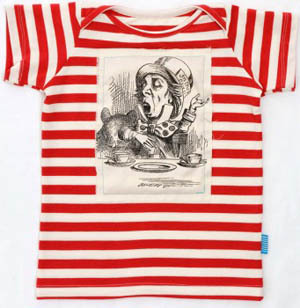 And we love the stripey tees with original etchings – with Alice for girls and that Mad Hatter again for boys. Check Heavenly Creatures’ site for a full list of stockists. But be quick if you love them too – these are from Heavenly Creatures’ summer collection so stocks are limited. And what of the tea party? You’ll need something to keep those cupcakes and petit fours fresh. 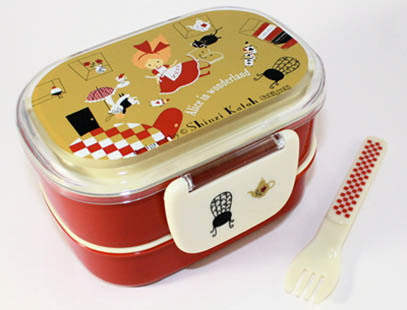 We suggest these whimsical zakka accessories from Shinzi Katoh Designs. You’ll find some pieces at Monkey and Wellington and Kawaii For You but to really go nuts, stop in at Shinzi’s own website for notebooks, pencil cases, chopsticks, cutlery, canvas bags, cups, drink bottles, storage baskets, soap dispensers, teapots, towels, stickers, dinnerware, suitcases, storage boxes, even a cover for your iPod – all channelling Alice. Of course, no tea party can exist without cupcakes. And cupcakes need cupcake toppers. We think these cheeky Eat Me toppers will set the perfect mood. 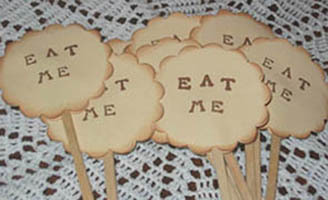 They are US$3.25 plus post for a set of six from Etsy seller Kibbles, and essential for Wonderland-themed birthday parties. 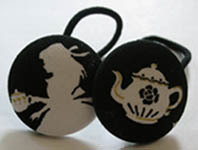 We’ve also found the perfect Wonderland tea set to accompany those sweet treats. 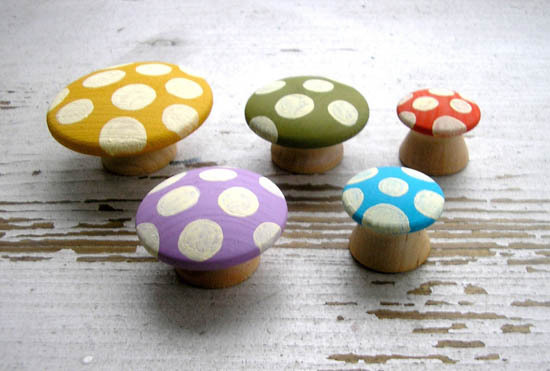 Feast your eyes on the gorgeously quirky Mad Hatter-inspired Toadstool Tea Set from Mahar Drygoods. 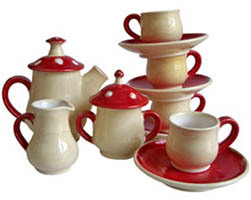 Made from hand-thrown ceramic, the limited edition tea set costs US$160 and can be delivered to Australia. 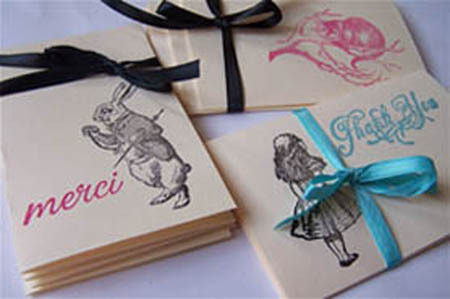 Follow up your party with some delightful Alice thank you cards – US$8 for a set of 12 hand-stamped cards from Factory Girl Ashli, also at Etsy.